Great, thanks Review by J. Flood "Mir"
Memory was easy to install Review by Jim L.
Ok I guess .... so far Review by SteveB "SB999"
Skeptical at first, but glad I did. Review by Ster L.
The memory worked as advertized Review by Jerry M.
Great Product Review by Michael J. Courtney "mikeretired"
It's challenging to order the RIGHT chips on-line, but this was so easy I was skeptical. More Memory greatly improved performance Review by ThebigU "Bob U"
Works for Optiplex 745 Review by Darren H.
As described. Works as intended. 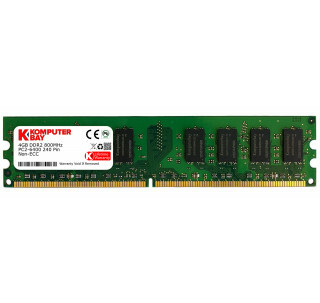 Great price Review by Mark L.
Memory worked great Review by glbpab1225 "glbpab1225"
Good memory Review by KC117MX "KC"
Recieve in time, worked as soon as I installed it, and so far no problems. Excellent Memory! Super Price! Review by Phyllis McNeil "utilityquiltlady"
Needed to upgrade an older computer so it could use Win7 (M$ killed XP!). Don't regret my decision one bit. Even stressed the memory with a burn-in utility and it didn't stumble once. I needed some RAM for a media server but I didn't want to pay the ridiculous amount that dell wanted. Found this and it works just fine. The price was good so i bought it. Review Review by vonagner "vonagner"
Fair Price for Good Quality DRAM Review by Lewis De Payne "Lew Payne"
Good product. Good enough for a Haiku! Review by Dr. StrangeBrew "marekjjones"
Very Good memory upgrade for Windows 7 Review by Stephen S.